LITTLEWICK Road had to be closed in the early hours of Monday after yet another water supply pipe ruptured, adding to the traffic chaos around Woking caused by extensive roadworks in the town centre. The gushing leak from a watermain trunk, believed to be up to 60 years old, caused the highway to collapse and the road had to be shut to traffic between Horsell Birch and Lockfield Drive. Water flooded into around 12 homes in Littlewick Road, ruining floors and furniture, after a trunk main ruptured just after 4am. It was the second time this year Littlewick Road has been closed because of a burst main: it was shut two weeks ago at the junction with Chobham Road for pipe repairs. As if drivers in the area haven’t been struggling enough to find alternative routes , a sinkhole in Old Woking Road, near the junction of White Rose Lane, opened up again this week, just days after it had been repaired – causing the road to be shut at least until this weekend. A Littlewick Road resident told the News & Mail: “I realised something was wrong just after 4am and rushed downstairs to see water lapping against my front doorstep. Affinity Water said on Monday that the 15in cast iron main probably burst because of pressure from vehicles passing above it. He added that the damaged section was being replaced with a pipe made of modern composite materials. Contractors had repaired the trunk and water was flowing through it again by lunchtime on Tuesday. Littlewick Road was expected to be open to traffic yesterday (Wednesday). An Affinity spokesman said that people whose homes had been flooded would be compensated for the damage. “Our incident support manager has visited the site and we have arranged for a contractor that specialises in repairing flood damage to attend,” she added. 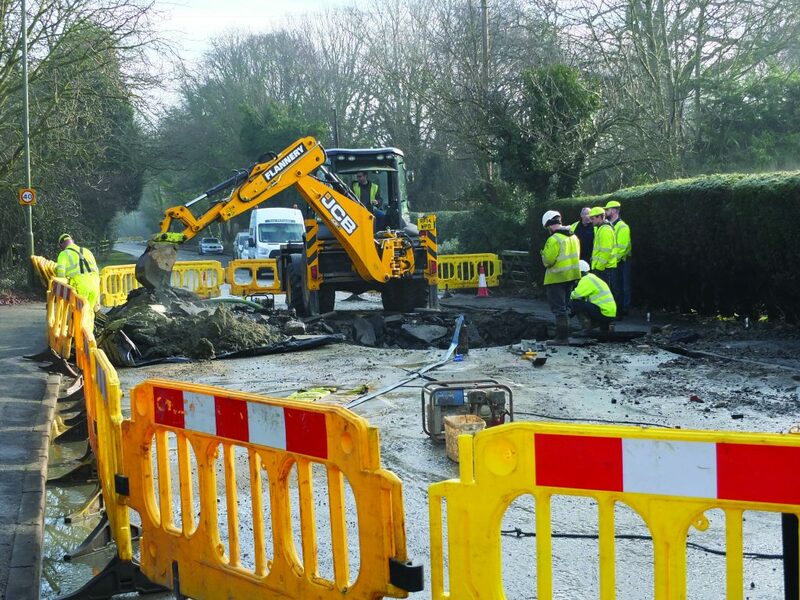 Problems with ageing watermains have caused problems on the busy A320 between Woking and Chertsey, where repairs to ruptured pipes have led to at least seven road closures in the last five years. In Old Woking Road, highways engineers are trying to discover what is causing the recurring sinkhole, on a route used by many to avoid the chaos in Woking town centre. Old Woking Road will be shut at least until the weekend but the engineers say repairs might have to continue until Monday. Meanwhile, phase two of the traffic management layout in Victoria Way began on Monday and is expected to last six weeks. Victoria Way has been reopened to southbound traffic but closed to vehicles travelling north, which have been diverted via Goldsworth Road, Church Street West and Forge End. Goldsworth Road is closed eastbound between Morrison’s roundabout and the junction with Church Street West, which itself is one way towards Forge End. Further works needed for the redevelopment of the town centre will start on Saturday (10 February) and are due to last for a week.